Please click here if you would like to skip the introduction and go direct to our walking holiday destinations in Scotland, UK. Scotland occupies the northern third of the British Isles and is bordered by land only to its south where it joins with England. A large percentage of Scotland's land surface is made up of islands, although of the 790 or so islands, only 90 are inhabited. Scotland's main centres of population lie in the Central lowlands with Glasgow and Edinburgh, its capital, being the main cities. The remainder of Scotland is sparsely populated by Western European averages. Scotland is an upland country consisting of mountains, high plateaux and deep valleys. Although its mountains are not particularly high, the highest being Ben Nevis at 1344m above sea level, they are often remote, inaccessible, surrounded by rocky and steep faces and are prone to harsh weather, especially in winter. Scotland was entirely covered by ice sheets during the ice ages of the last 2 million years and this has shaped the wild and sometimes desolate nature of the landscape with hundreds of beautiful glens filled with narrow lakes. They have also helped to create a complex coastline of long peninsulas and drowned valleys, especially on its western coast. Scotland is known the world over for its picturesque landscapes with many people visiting the country each year to walk its wild mountains and valleys. 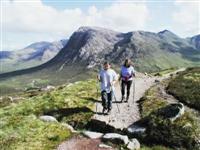 Walking holiday areas include the Trossachs, the West Highland Way, the Cairngorms and the Isle of Skye. Many walkers will visit the highlands and islands which make up the northern half of the country, lying to the north and west of the Highland Boundary Fault. This is a mainly mountainous region with just under 300 peaks over 3,000ft above sea level, which are known as Munros. These mountains are generally made up of ancient rocks, interspersed with more recent igneous intrusions which have formed some distinct mountain ranges such as the spectacular Cuillins on the Isle of Skye. The economy of the highlands and islands are dominated by agriculture with sheep and cattle, forestry, tourism and of course, whisky production. Scotland's wildlife is typical of the north west of Europe, although several of the larger mammals such as the Lynx and wolf were hunted to extinction in historic times. There are important populations of seals and internationally significant nesting grounds for a variety of seabirds. The Golden Eagle is also present. Remnants of the native Scots Pine forest exist and within these areas the Scottish Crossbill, Britain's only endemic bird, can be found alongside Capercaillie, Wildcat and Pine Marten. In recent years various animals have been re-introduced, including the Red Kite and Wild Boar. The flora of Scotland is varied incorporating moorland and tundra species. Although Scotland has been part of the UK since 1707, the continued existence of its own educational, legal and religious institutions, distinct from those in the rest of the Britain has helped to safegaurd Scottish culture and local identity. As well as English, Scotland still has Scots and Scottish Gaelic as official languages, the latter being used mainly on the islands. Scottish music is a significant aspect of the nation's culture, with both traditional and modern influences. The most famous traditional Scottish instrument is the Highland Bagpipe, a wind instrument consisting of three drones and a melody pipe (called the chanter), which are fed continuously by a reservoir of air in a bag. The harp, fiddle and accordion are also traditional Scottish instruments, the latter two heavily featured in Scottish country bands. The climate of Scotland is temperate and is influenced by the Gulf Stream and Atlantic weather systems. Summers are rarely hot with an average maximum of 18°C and the overall weather could be classed as changeable. Weather systems tend to pass through reasonably quickly. The weather can be very localised due to the effect of the mountains with some areas experiencing heavy rain, whilst the adjacent valley is in sunshine. 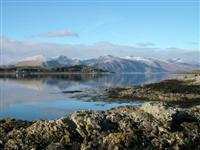 Below are listed the locations of our independent walking holidays in Scotland. Guided walking holidays can be arranged for private groups. Explore the northern sections of the West Highland Way, Scotland’s most famous long distance route, including lonely Rannoch Moor and Glen Coe. The rugged coastal and mountain scenery of the Isle of Skye is stunning, whilst the Knoydart Peninsula on the mainland's west coast is referred to as "Britain's last wilderness." Explore this beautiful and wild coastal region with amazing mountain views, and enjoy a pint in the remotest pub in mainland Britain. 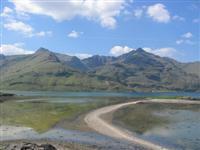 The Trossachs encapsulate much of the beauty and wilderness of Scotland with wild glens and sparkling lochs. Often regarded as the ‘Highlands in miniature’ the region contains a number of beautiful and stark mountains which provide picturesque backdrops to the serene lakes. Oban is a busy fishing port with great local traditions and provides an excellent base for exploring a couple of the numerous islands off the Scottish coast. Each island has its own unique character with stunning wild scenery, rich fertile valleys and beautiful historic settlements and castles.